How do you keep a child’s bedroom tidy? Here are three tips I use to contain clutter, keep a calm bedroom atmosphere and still invite plenty of play. How do you keep a bedroom tidy? I’ve been thinking about my kids’ toys a lot recently. If I had my kids over again I’d be tempted not to buy them any toys at all but of course, we do have plenty of toys in the house and every so often we still get to the point where we need a big clear out. I always feel this around about now when the clocks change and we’re heading into the festive season . In a few weeks time there will be a fair few new toys and books arriving, even with modest Christmas giving. Do you mind whether your children keep their bedroom tidy? I’m no neat freak but really don’t like the girls to have messy bedrooms. I think they sleep better in a calm room, rather than one filled with clutter. Reading Simplicity Parenting (affiliate link – NurtureStore gets commissions for purchases via this link) a few months ago resolved me to tackle the girls’ rooms and have a big clear out. We followed the ideas in the book, saying goodbye to lots of things and putting others away in boxes on top of wardrobes. All we have out now are a few special toys, which we can rotate with the goodies in the storage boxes when they want a change. The girls love it. Having less toys seems to magically promote more playing. Both enjoy being able to get straight into play, rather than having to search under beds to find things. Not being overwhelmed by the choosing means more time and energy is available for imagining and creating. Motivate your child: I wanted to make sure the girls were with me on the Big Clearout, so we focused on what the advantages were for them. For one, who likes a tidy bedroom but doesn’t like to actually tidy, it was about making this easier for her to manage. For the other it was about making it easier to have out her favourite little toys, without them going astray all the time. 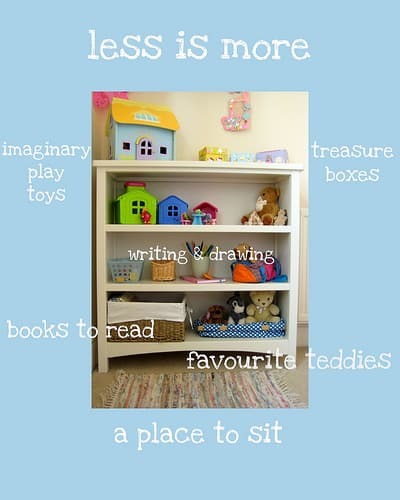 Focus on less is more: Less toys, less overwhelming choices, less tidying, less clutter, less things going missing. More calm, more play space, more easy access to the things you really love, more play time. What about you? Are you in the less is more gang? 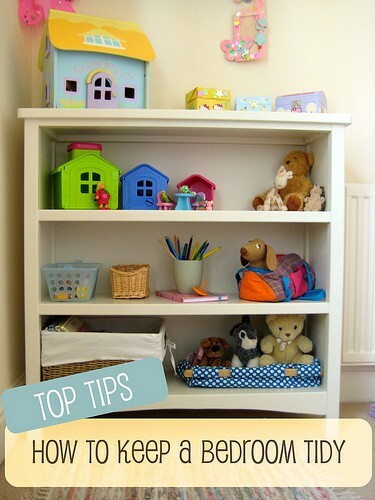 Do you leave your kids to decide for themselves how toys are organised in their own rooms? Do you have a naturally neat child, who keeps their own room spick and span? What tips do you have to share on how to keep a bedroom tidy? Oh I have to agree!! I have 2 boys that can’t keep their room clean with nothing in it! We’ve been working on the less is more principle and keeping a tidy room. It’s definitely a work in progress! Great post, my children are teens now, but I remember a time when I was looking at their sea of bright toys, and new I had to make a change. Slowly over 6 months I removed the least important toys, and also replaced some with beautiful wooden toys, and was very pleased with the result. Much easier to keep tidy as well as better play. I very much agree with keeping Christmas simple, with a few beautiful special toys, and lots of family time! Great post! Lovely post! We recently moved our 3 from a small room into a bigger one so they can have more space to keep toys and play. I’m all for the less is more idea but persuading the kids to feel the same is proving more difficult. However, their room isn’t too cluttered and they are keeping it tidy so something must be working! I’m totally in the “less is more camp.” We just did (another) big clean out, and of course, it leads to lots of contented play in their bedroom as my boys enjoy the clean space and open area. It’s been neat to see as they get older how the boys start to really understand that they ENJOY having less toys, because they can play with them easier. Even though we try no to accumulate too much, they still helped me choose two boxes of toys to give away. I am terrible at less is more. It makes perfect sense but I come from a long line of hoarders. Your post has come at the perfect time though as I am feeling overwhelmed by stuff – I should give the big clearout a go. my daughter has a dollhouse, books and stuffed animals in her room. from day one i felt this was important. we didn’t have lots of money growing up but somehow we had rooms full of junk. i am a terrible cleaner as an adult and i really want to set my kids out on the right path. My husband and I have been talking a lot about what is the appropriate amount of toys/books/art supplies. I don’t feel we have a lot but I think there is always room to downsize. My husband is in the camp of wanting to get rid of everything. First a question – is that shelf really all you have for both kids?!?! If so, I have still a long way to go. I also struggle because we have 3 kids at very different developmental ages (6.5, 3.5 and 13 months) so we have a range of toys to cover that age gap. I keep telling my husband that when the baby grows out of the baby toys, it will really help. There will be a bunch to get rid of then. But then, the older one might have different things….pffft. Hi Alison – it’s lovely to receive a comment from you, especially as I really enjoy your blog. This book case is in my 5yr old’s bedroom. She has a little table and chair with a pot of pens and paper, and another book basket, and that’s it for her room. We have a playroom downstairs too with a big book case, table and chairs and a couple of extra shelves – so no, this isn’t the only thing we have, but we follow the same principle of less is more in the play room too. I have a 3 1/2yr spread between my girls, and have had babies that I have worked with too – so I understand what you say about the age range difference. *But* one thing I think that really helps – to manage the clutter, to spark creative play, and to work with a range of ages – is to have toys / materials that are open-ended, so everyone can use them. Wooden blocks, staking cups, little animals characters, junk modelling boxes… are the kind of timeless things that my kids have been playing with from birth through to now age 9. Hey there, this looks great, I want to make something like this happen for me. How old are your kids? My oldest is 5, generally if I do I clean out I really just need to do it by myself otherwise nothing will get thrown out/moved on etc because they “love” everything. And everything (including the ripped piece of paper on the floor) is very important!! I agree with the temptation not to buy them any toys, and me and my husband actually do buy them hardly anything!! Unfortunately they have relations and one set of grandparents that live in different country and therefore they have far too many toys. And so many of them have a “sentimental value” as in, it would offend the giver if they realised their gift had been given to the 2nd hand store or something. Hi Shannon. My daughters are 5 and 9 and I find this ‘less is more’ approach much easier with my 5yr old. She thrives on routine and loves to have everything in it’s home. I think starting this with her from a very young age has been really helpful in establishing it as the way we do things. With gifts from family I think this can still work. You might not give all their special gifts away but they can still be stored away and then brought out in rotation to be enjoyed and played with – without being out all the time. Thanks for taking the time to comment – great to chat with you. Hi Lucy. The one on top was from the Early Learning Centre and came with a Goldilocks and the three bears set. The three smaller ones that stack inside each other are a Three Little Pigs set which were a present from a friend in Spain from a shop called Imaginarium. We are certified memebers of the less is more club!! In the begining of the year we donated or sold 95% of what we own, rented our home out, and now are traveling the world with our kids. We’ve been in South America for 1 month now:) It feels so good to “meet” other bloggers who aren’t into collecting and accumulating, but being realistic about what we really need in life. For the boys, we have one bedroom, and one roomplay. They have nothing in the bedroom except the bed and the clothes, so they just can sleep ! We tidy up the roomplay every evening, but don’t mind if no… The toys are packed in high storages in the roomplay. Love your ideas!!! I am a mom of 3 grown boys and a preschool teacher. people always ask how do I get my class room so clean. “A place for everything and everything in its place” is my motto. Love your ideas of rotating toys, that also helps stimulate their imagination. We do that at school, sharing bins of toys with the other teachers. I am a single mom of 2 boys that are one and three. They have to share a small bedroom. My one yr old is a crib and three yr old is in a toddler bed. I’m so overwhelmed by all their toys and how to organize it all?? I have no space and they are obsessed with cars and trucks. Some of the toys are so big but they love them. I want them to have a nice fun organized room. It has no theme. Basically it’s a room with their beds and a dresser. I’m in desperate need for ideas. Thank you!! We are for sure in the “less is more” club here. With 4 little ones (6,4,2,8m) I feel one of my mail jobs as a Mom is on “clutter control” daily. I used to keep ALL the toys in the playroom downstiars, with bedrooms upstairs and it worked well for keeping tidy bedrooms. Then we needed more playroom space for my son’s (only boy) toys and the girls didn’t want him getting into “their” stuff. 🙂 So we moved all the princess/barbie/american girl, etc things up in their room. And it has been a disastor pretty much since then! I’ve done SEVERAL clear outs and bagged up over 1/2 of it and stored it away to rotate..but still messy! I need to have a bookshelf similar to your set-up, I think that would help (everything just lined up against the wall and little pieces in plastic crates). In our playroom, I have several “stations” that invie open-ended play that appeals to all 4.